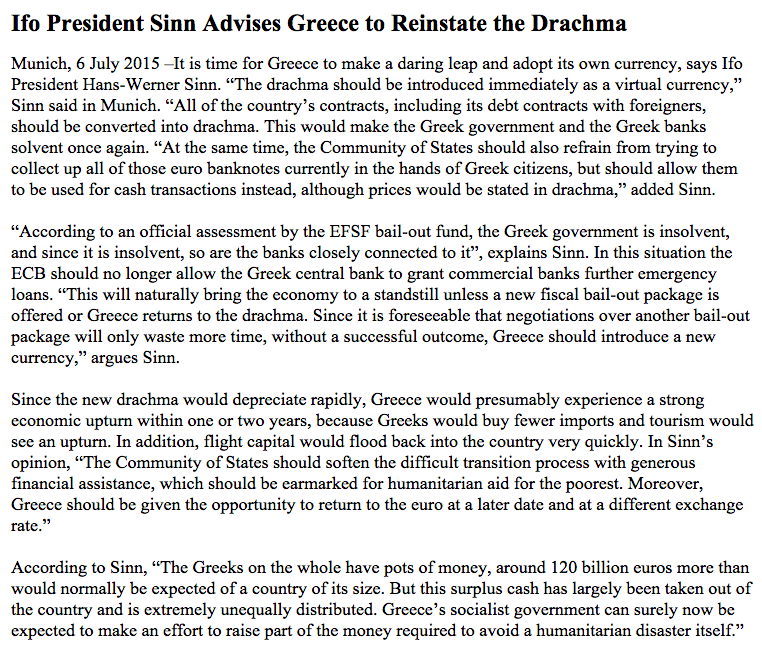 In simple terms: make Grexit. As this stage int the game, I agree - facilitated (using European financial and investment supports) exit by Greece from the euro area is the optimal resolution path to the crisis. The arguments about new costs are irrelevant: Greek debts are currently unrepayable and will not be made good by any structural reforms. In fact, the debts are holding back the effectiveness of such reforms and will likely wipe out all and any benefits of devaluation that can be gained from conversion into drachma. Whether Greece remains in the euro area or exits, either path will require a write-down of more than 30% of Greek Government debt (my estimate - at least EUR125 billion, in line with recent IMF estimate, although my estimation is higher, since the IMF assessment was prepared prior to the Greek economy deteriorating further and the country fiscal position weakening beyond April 2015 assessments) and some additional assistance (in form of investment funds from the EU) to the tune of EUR20-30 billion over 3 years. The write-downs should be carried out via ECB and monetised as a part of the ECB QE (wiping out the losses) so the only new call on EU funds will be investment funding. 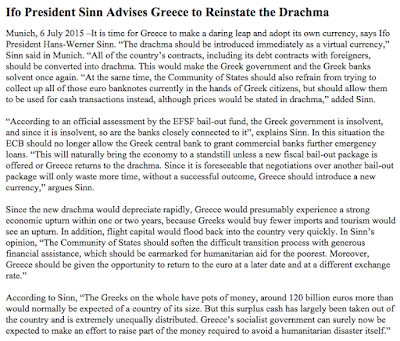 Drachma return will have to be used to carry out immediate fiscal adjustment (so there will be plenty of pain and reforms on that front). Ex-IMF official sector holdings are at 68%. IMF should, by all possible metrics, take a bath too, but it won't, so the 9% of the total liabilities held by the IMF is not at play. Banks can take a haircut, but that will require recaps (Greek banks) and/or is utterly immaterial in quantum of debt held (1% for Foreign Banks). Other bonds above are predominantly short-term stuff that can be haircut. 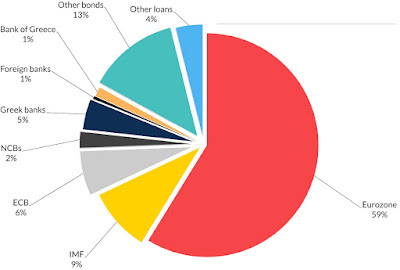 No matter how you spin the numbers - Eurozone holdings will have to be cut by more than a half.